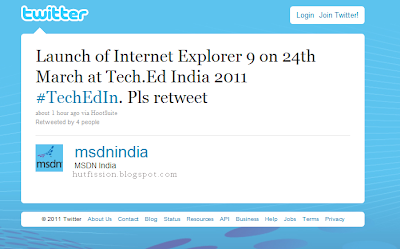 Internet Explorer 9 RC was released on February 10 and then according to the rumors the final version of Internet Explorer 9 was scheduled to be released on March 14 but MSDN India team has just tweeted that the final version of Internet Explorer 9 would be launched on March 24 at Tech.Ed in India.Microsoft Tech.Ed would commence from March 23 till March 25.We have already seen that there has been increase in the Internet Explorer share for the month of February and IE 9 has already been downloaded 36 Million times. Internet Explorer 9 now itself represents around 0.66% of all worldwide browser usage share on Windows with 2.09% usage share on Windows 7.The Internet Explorer market share for February has been increased by 0.78% across all operating system and 0.86% in Windows Operating system. The total market share of Internet Explorer for February was 56.77%.As final version of Internet Explorer 9 is going to be released on March 24th, we could expect a further increase in the Internet Explorer market share for upcoming months.